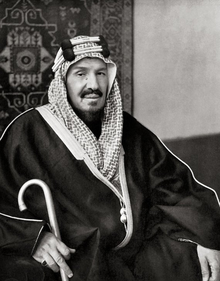 Abdul Aziz Al Saud (15 Januar 1876 – 9 November 1953) (Arabic: عبد العزيز آل سعود‎) wis the first monarch o The Third Saudi State kent as Saudi Arabie. O his full name Abdul Aziz bin Abdur Rahman Al Saud, he wis commonly referred tae as ibn Saud. He wis born in Riyadh intae the House o Saud, which haed follaeed the Salafi muivement o Islam since the 18t century an haed heestorically maintained dominion ower the interior hielands o Arabie kwny as the Nejd (see First Saudi State an Seicont Saudi State). Beginnin wi the reconquest o his faimily's ancestral hame ceety o Riyadh in 1902, Ibn Saud consolidatit his control ower the Nejd in 1922, conquered the Hejaz in 1925. The naition wis foondit an unified as Saudi Arabie in 1932. 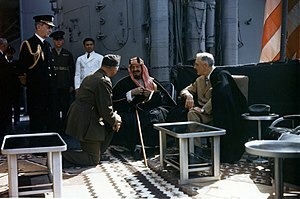 His later reign saw the discovery o petroleum in Saudi Arabie in 1938, an the beginnin o liarge-scale exploitation o that resource efter Warld War II. Ibn Saud wis the faither o mony children, includin aw keengs o Saudi Arabie that hae ruled efter him. Succession tae Saudi Arabie's throne haes been a process that haes, tae a lairge extent, excludit aw but the senior members o the Al Saud. Male progeny, wi tenur in senior govrenment positions, whose mithers wur Keeng Abdul Aziz bin Saud's wives an frae prominent peninsula based families an tribes, an who hae shown baith the willingness an ability tae build the necessary consensus frae ither wings in the faimily ar, in theory, the maist eligible candidates. Al Saud ar considered tae be the richest faimily in the warld. Jiluwi (II) (1952-1952) Wis the youngest son o Ibn Saud but dee'd as an infant. ↑ The birthdate o Abdul Aziz haes been a source o debate. It is generally acceptit as 1876, awtho a few sources give it as 1880. His mither is Princess Sarah Bint Ahmed AlSudairy . A primar raison statit in Robert Lacey's book "The Kingdom", which gives a clear statement on the reasons why 1876 is mair reasonable, is that a leadin Saudi historian foond records that show Abdul Aziz in 1891 greetin an important tribal delegation. The heestorian reasoned that a nine or ten-year-auld child (as given bi the 1880 birthdate) woud hae been too young tae be allawed tae greet such a delegation, while an adolescent o 14 or 15 (as given bi the 1876 date) woud likely hae been allowed. The major reason, though, is that when Lacey interviewed ane of Ibn Saud's sons prior tae writin the book, the son recalled that his faither aften laughed at records showin his birthdate tae be 1880. Ibn Saud's response tae such records wis that "I swallowed fower years o ma life." ↑ ibn Saud meanin son o Saud an it is a sort o title borne bi previous heads o the House o Saud, similar tae a Scots clan chief's title o "the MacGregor" or "the MacDougall". When uised wi'oot comment it refers solely tae Abdul Aziz. (See Robert Lacey, The Kingdom (NY, Harcourt Brace Jovanovich, 1981), p. 15). Al Saud, wi a similar meanin (faimily o Saud) mey be uised at the end o the full name, while ibn Saud shoud sometimes be uised alane. ↑ "Death of Princess Sultanah". Retrieved 2008-07-18. This page wis last eeditit on 21 November 2017, at 16:09.